Vintage Norton Motorcycles: Cannonball Nortons ! -JdK- Keith just contacted us to inform his team just finished the Motorcycle Cannonball. "The 1924 and 1923 Model 16H Nortons made all the miles and both finished with a perfect score. The 1915 bike missed 11 miles when the tappet block threads stripped in the engine case. We rode 3500 miles in 15 days through some of the finest roads in the USA. 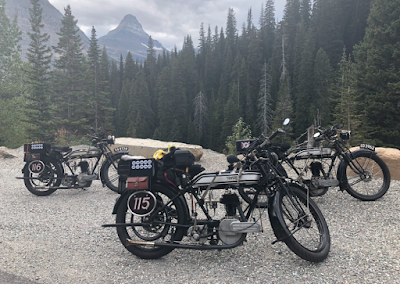 The photo shows the bikes in Glacier National Park."